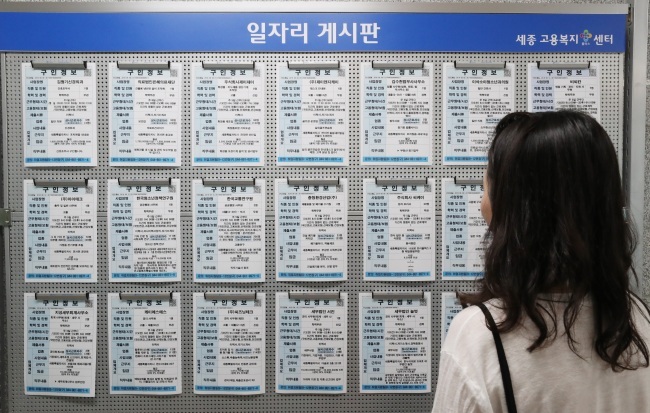 The youth unemployment rate, which tracks Koreans aged 25-34 who have not secured jobs, reached its highest in South Korea in 19 years last month, government statistics showed. Concerns are rising over the effectiveness of the Moon administration’s pro-labor policies, such as the latest minimum wage hike, and whether or not these measures are in any way responsible for the current unemployment crisis. According to Statistics Korea, 338,000 young Koreans were unemployed last month. The number is the highest since youth unemployment marked 434,000 in 1999, as the nation was still recovering from the 1997 Asian Financial Crisis. The number of young Koreans out of work has been significantly increasing over the last three years. In July 2015, 285,000 young Koreans were unemployed, but the number rose to 319,000 in the same month in 2016, to 327,000 in July 2017 and 338,000 last month this year. Notably, the unemployment rate among Koreans who have university degrees also hit the highest since 1999, measuring 3.7 percent. In 1999, it was 5 percent. Some experts say the current Moon Jae-in government’s purportedly pro-labor policies, including the latest minimum wage hike and reduction of maximum weekly work hours from 68 to 52, may be great contributors to the increasing number of young Koreans unable to find jobs. Partly due to the implementation of these measures, South Korea’s small private firms -- defined as companies with 300 or fewer employees -- chose not to hire as many new workers this year. According to government statistics, small firms in South Korea hired 76,000 fewer new employees last month than the year before. It is the first time in eight years that small businesses in South Korea reduced the number of their new hires, either by bringing on fewer workers or not hiring anyone at all. A record-high number of Koreans also involuntarily left jobs at bars and restaurants in the first half of this year. Among all restaurants in the country, 87 percent are classified as small businesses, with a maximum of five employees. Small business owners, including those who run restaurants, have complained they cannot afford to pay the new minimum wage, which rose by 16 percent to 7,530 won ($6.70) an hour, starting from Jan. 1. The country’s large firms, defined by those with a minimum of 300 employees, also reduced employment from January to March this year by 3.94 percent, compared to the first three months in 2016. This means young job seekers this year had some 4,000 fewer positions in the private sector to apply for. Another factor behind the crisis, some experts say, is the Moon administration’s pledge to create 174,000 more jobs in the public sector by 2022. Next year alone, it will create 9,475 civil servant positions in the central government. Civil servant positions are among the most sought-after among young Koreans, as they offers job security -- one will be guaranteed of full-time employment until age 60 -- and stable income. Experts, including Park Woo-ram, who is a researcher at Korea Development Institute, say the pledge will push even more young Koreans to prepare for the state-run civil service exams, putting off employment indefinitely and thereby increasing the nation’s youth unemployment rate. In April, some 202,000 Koreans took the civil service exam, which was given to select and hire 4,950 new civil servants. “I have a friend who has spent five years preparing for a civil service exam. She is 33 and is considered to be ‘too old’ by the HR in private firms in the country,” said a working professional surnamed Kim in Seoul. A study last year by the National Youth Policy Institute estimated that some 1,228,000 Koreans aged 15-29 are not in education, employment or training. They accounted for 20.9 percent of all Koreans aged 25-29, and 13.4 percent of those aged 20-24. The largest proportion of them, 38 percent, said they chose to be a NEET – someone “not in education, employment or training” -- simply because “they enjoy not doing anything,” and 22.5 percent said they could not find a job that they liked. At the same time, 18.3 percent said they had not figured out what they wanted to do in life. A webtoon titled “Nice to NEET,” which shares the artist’s own experiences being a 26-year-old NEET in South Korea, offers some insights into why many young Koreans voluntarily choose not to be employed. The author’s Instagram account, nicetoneet, has some 18,000 followers. When the author worked part-time at a sushi restaurant, she witnessed her employer reusing uneaten food. She was also often mistreated by the kitchen staff and her employer, some 20 or 30 years her senior, who would leave work early after piling their work on her. While working full-time at a design firm, she had witnessed office bullying and was told that wearing jeans was not appropriate for the office. When she was late by a few minutes for work the first time since getting the job, she was scolded by a superior -- who would come into work late all the time -- that what she did that day was not acceptable. Stressed, she vomited what she ate for lunch that day. She eventually quit the job and voluntarily chose to be a NEET individual. “I started this webtoon because I started questioning myself -- am I the only one who has had a hard time adjusting to work life in this country?” she wrote in a letter to her readers.